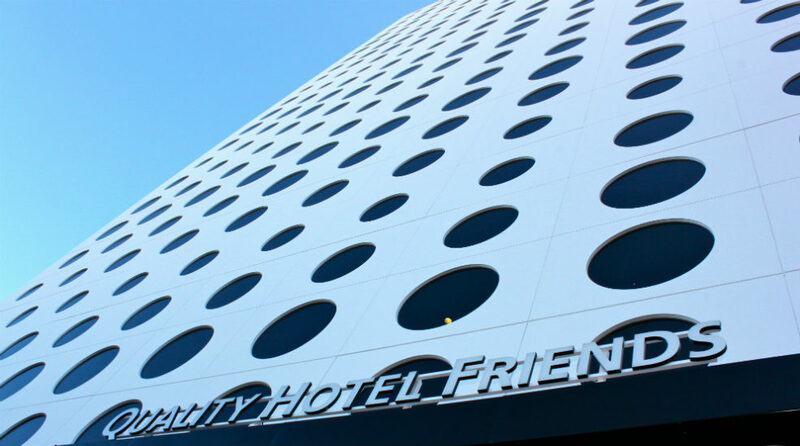 We hope to you soon at the Quality Hotel Friends! Below you'll find a list of frequently asked questions for those of you planning a stay at the hotel. Please don't hesitate to contact us in case you have any further queries. There are a limited number of parking spaces next to the hotel, where you can park for 20 SEK/1h or 175 SEK/24h. Please note that spaces cannot be reserved and that some of the spaces have charging stations to be used by electric cars only. If the parking facilities at the hotel are full and you are planning to stay more than two hours, we recommend you to park at the Arena garage on Evenemangsgatan. For shorter stays, you can park free of charge in the garage at the Mall of Scandinavia for up to two hours. If you stay longer than two hours, you will be charged for each additional 30 minutes. Find out more about prices and terms here. The Quality Hotel Friends is a cash-free hotel. This provides a safer working environment for our staff as it reduces the risk of theft and burglary. It also means that we have more time to spend on taking care of our guests. For guests it means faster and more secure payments. We accept all major debit and credit cards. Please contact us for more information. To get to the hotel from the Solna commuter train station, simply walk through the shopping centre. The quickest route is via the entrance between the main entrance and the entrance by O'Learys. Lounge 24 is our self-service shop in the lobby that is open 24/7. You can purchase a wide range of products here, including snacks, light meals, and cold and hot drinks. In the mood for espresso? Count on Lounge 24! There is a luggage room next to the lobby where you can store your luggage before and after your stay. Our free WiFi can be accessed from anywhere in the hotel. Either get an access code from the reception or log in using your Nordic Choice Club membership number (printed on your membership card). It really couldn't be easier! No problem! The reception sells just anything you might need: toothbrushes, toothpaste, razors, shaving foam, shampoo, conditioner, body lotion, shoe polish and sewing kits. Want to treat yourself to an extra special stay? How about a suite with spectacular panoramic views of Stockholm? Then go ahead and contact our reservations department on +46 8 705 70 00 or email us at q.friends@choice.se and we'll tell you about the options available to you.